Jerusalem District Court rules residents of Mitzpe Kramim are the legal owners of their land under 'Market ouvert' clause. The Jerusalem District Court on Tuesday accepted the claim of the residents of Mitzpe Kramim in Samaria to apply the 'Market ouvert' clause to their town, stating that they own the rights to the lands on which Mitzpe Kramim is built. 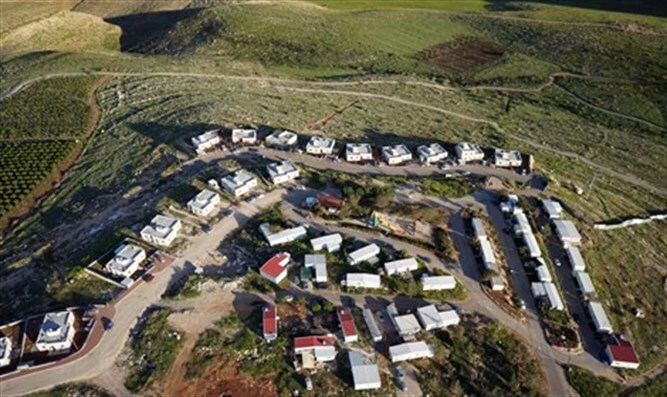 The application of this clause constitutes a green light for the planning of construction omMitzpe Kramim, which was established in the late 1990s, and is home to dozens of families. In this way, the court established a legal precedent for the regulation of young communities, throughout Judea and Samaria. The ruling was made possible after Attorney General Avichai Mandelblit changed the position of his predecessor, Yehuda Weinstein, and informed the court that he was not opposed to the application of the clause on Mitzpe Kramim. Mitzpe Kramim was established in 1999 under former Prime Minister Ehud Barak. The settlement was initially established at a different location in the area of ​​Kochav Hashahar, and was transferred to the current location following the "outpost agreement". The location was determined after it became clear that the place was located within the urban planning area of ​​Kochav Hashachar, which the original location was not. After the establishment of the vineyards in the present location, a significant permanent construction began, along with the continued residence of some of the residents in the caravans, and the future of the settlement seemed assured. However, seven years ago, after petition was filed with the High Court of Justice claiming that the town was established on private Arab land, the entire development of Mitzpe Kramim was halted. After several court battles, the residents filed a claim for ownership by virtue of a number of causes, the most important of which is Section 5 - the market regulation, which states that a person who has in good faith leased or bought land from the Custodian of Government Property and abandoned property in Judea and Samaria knowing that the land belongs to the Custodian maintains ownership even if there was an irregularity in the purchase. The claim has been clarified since 2013 in the Jerusalem District Court, and the High Court's proceedings against the neighborhood are currently delayed. Yisrael Ganz, deputy head of the Binyamin Regional Council, welcomed the ruling. "The court's decision today is a dramatic victory, a moment of hope for the young settlements. Today, the light of the young settlement in Binyamin and in all areas of Judea and Samaria waiting for the processes of regulation. I undertake to continue to promote, as head of the Council, the arrangement of the entire settlement - with the government and the judicial system. It will no longer be chaos, but order. And to the residents of Mitzpeh Keremim, I am proud of you for a determined and inspiring struggle that will be recorded in the history pages of the settlement in the Land of Israel."